Students from Texas high schools got a first-hand glimpse of what it takes to be a forensic scientist as members of Dr. Jeff Tomberlin’s lab volunteered during the recent Youth Adventure Program camp this summer. The camp was one of several week-long courses that were held during the summer months to help gifted and talented students to learn and explore different career options in today’s world. The forensics camp hosted in the Heep Center was to help ninth through twelfth graders to learn more about forensic science. The program encourages students to be highly motivated to learn, think and solve problems and have a strong interest in attending college or professional school in the future. During the week-long camp, the students got the chance to learn about forensics through lectures and demonstrations and hands-on activities with the volunteer teachers. Some of the topics the students learned included using DNA for forensics, forensic anthropology, learning how to analyze handwritten documents, as well as bloodspatter pattern analysis. 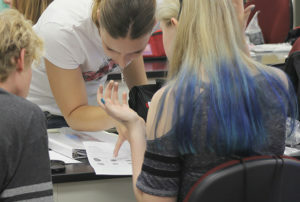 The students learned different techniques during the hands-on activities including making and analyzing fingerprints, studying bloodspatter patterns and DNA extraction techniques. During the final day, the students got the chance to search a mock crime scene using what they had learned throughout the week to solve the case they were assigned. They then had to present their findings during the afternoon portion of the session. YAP camp coordinator Dr. Adrienne Brundage said the newest parts of the camp included tire and footprint analysis, and another activity dealing with angles in bloodspatter. “Every year I try and do different things for the students,” she said. Brundage also said that the kids were very attentive and loved learning about forensics and also said that the camp is a great recruitment tool for the program. “I’ve got a good mix of kids this year,” she said. “There are a few that have taken the class several times already, and they are coming back one last time before applying to college. Ph.D. student Zanthé Kotzé loved volunteering and said that the camp was a great way to get the students interested in STEM fields and forensics.